The manifold and turbine housing of the Sonata 2.0T twin-scroll turbo is one cast stainless-steel piece. Its highly advanced design helps minimize lag and makes this powerplant lighter than a conventional turbo engine while putting out 245 horsepower. Specifically engineered to recover even more energy from the exhaust than a single-scroll turbocharger, the Sonata’s turbo improves combustion efficiency, and provides low-engine-speed efficiency. Everybody has a different take on steering feel. Some want more steering effort, others less. Well, with Drive Mode Select, now you get to choose. Drive Mode Select adjusts both engine mapping and steering effort to match your driving style. Select from three modes: Eco, Normal or Sport by simply touching a button on the center console. 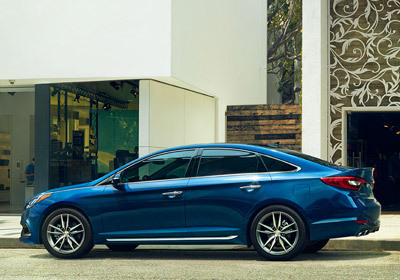 The Sonata Sport 2.0T and Limited 2.0T trim levels start with 18-inch alloy wheels and larger front brakes plus modified suspension and steering to deliver a sportier ride and increased steering response. A larger rear stabilizer bar reduces body roll and improves handling on curves. Stylish quad exhaust set in a sporty rear diffuser make the most of the turbocharged engine, while paddle shifters mounted on the D-cut leather-wrapped steering wheel put it all at the driver’s fingertips. 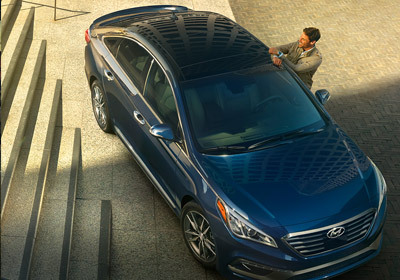 Enjoy the sun, the moon and the stars through Sonata’s available, class-exclusive, panoramic sunroof. This large glass roof opens wide to give you an unobstructed view above. This thoughtful available feature automatically switches from high to low beam headlights when an oncoming vehicle is detected by the front camera. While the LED Daytime Running Lights, available HID headlights, and LED tail lights not only look great but also add increased visibility. Using opposing electrical charges, the advanced rotational-dip paint process pulls primer and paint onto every inch and corner of the Sonata’s chassis and body, sealing them away from the elements and the effects of salt, rust and corrosion. The result is one of the highest quality paint jobs in the industry. Explore The Possibilities in Comfort. The interior offers much to enjoy. Such as an available leather-wrapped steering wheel and 5-inch touchscreen color audio system with rearview camera. Plus, find ten ways to perfect comfort with an available ventilated power-adjustable driver seat with power lumbar support. 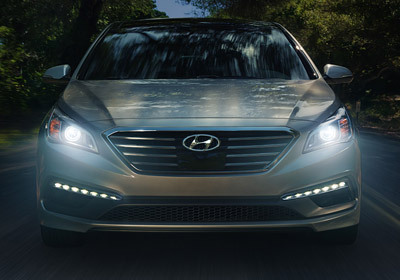 The Sonata has more passenger and total interior space than any other vehicle in its class. * In other words: There’s plenty of room for five, plus luggage. The Sport 2.0T and Limited 2.0T trim levels receive sport leather seating with contrast stitching, D-cut steering wheel with paddle shifters, aluminum pedals, and a sportier instrument cluster. Sonata’s available rear side sunshades are integrated into the door panels, so they’re out of sight when not in use, and can be easily raised by hand. Designed to help block out the sunlight, it’s a feature that adds privacy while shading passengers from bright sunlight and it’s especially useful for families with small children. This standard feature offers added protection for the driver and is just one more innovative element of Sonata comprehensive passive and active safety systems. This available radar-based system helps detect when a vehicle is in the driver’s blind spot and provides both an audible and a visual alert to help keep you aware as you move down the road. When reverse gear is selected, Rear Cross-traffic Alert helps identify and warn the driver of vehicles approaching from the side. Lane Change Assist measures the closing speed of an approaching vehicle in the adjacent lane to determine if changing lanes is safe and if it’s not, gives the driver an audible and visual warning. Drift outside your lane without signaling and this available system is designed to inform you with an audible and a visual cue. It turns technology into a tool that helps drivers maintain vehicle control and lane positioning. When this available feature is activated and it detects a vehicle in your lane ahead, it automatically slows the Sonata down maintaining a safe distance with the vehicle ahead and will even come to a full stop, then start again without driver input.